I finally managed to push myself forward and pick up an old, actually too old, idea since I ever arrived here in Mauritius more than six years ago. I'm talking about a community for all kind of ICT connected people. In the past (back in Germany), I used to be involved in various community activities. For example, I was part of the Microsoft Community Leader/Influencer Program (CLIP) due to an FAQ website on Visual FoxPro, actually Active FoxPro Pages (AFP) to be more precise. Then in 2003/2004 I addressed the responsible person of the dFPUG user group in Speyer in order to assist him in organising monthly user group meetings. Well, he handed over management completely, and attended our meetings regularly. Well, I don't want to bother you with the details but short version is that I was too busy on either job (building up new companies) or private life (got married and we have two lovely children, eh 'monsters') or even both. But now is the time where I was starting to look for new fields of activity; given the fact that I gained some spare time. My businesses are up and running, the kids are in school, and I am finally in a position where I can commit myself to community again. And I love to do that! Why a new user group? Good question... And 'easy' to answer. Since back in 2007 I did my usual research, eh Google searches, to see whether there are existing user groups in Mauritius and in which field of interest. And yes, there are! If I recall this correctly, then there are communities for Adobe, PHP, Drupal, Python (just recently), Oracle, Java, .NET, and Linux (which used to be even two). But... either they do not exist anymore, they are dormant, or there is only a low heart-beat, frankly speaking. 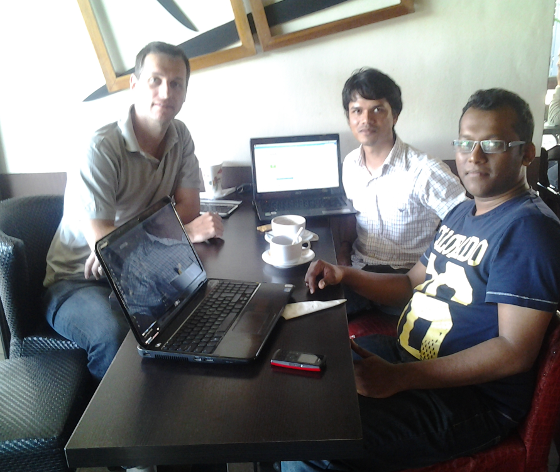 And yes, I went to meetings of the Linux User Group Meta (Mauritius) back in 2010/2011 and just recently. I really like the setup and the way the LUGM is organised. It's just that I have a slightly different point of view on how a user group or community should organise itself and how to approach future members. Don't get me wrong, I'm not criticizing others doing a very good job, I'm only saying that I'd like to do it differently. The last meeting of the LUGM was awesome; read my feedback about it. Ok, so what's up with 'Mauritius Software Craftsmanship Community' or short: MSCC? As I've already written in my article on 'Communities - The importance of exchange and discussion' I think it is essential in a world of IT to stay 'connected' with a good number of other people in the same field. There is so much dynamic and every day's news that it is almost impossible to keep on track with all of them. The MSCC is going to provide a common platform to exchange experience and share knowledge between each other. You might be a newbie and want to know what to expect working as a software developer, or as a database administrator, or maybe as an IT systems administrator, or you're an experienced geek that loves to share your ideas or solutions that you implemented to solve a specific problem, or you're the business (or HR) guy that is looking for 'fresh' blood to enforce your existing team. Or... you're just interested and you'd like to communicate with like-minded people. Meetup of 26.06.2013 @ L'arabica: Of course there are laptops around. Free WiFi, power outlet, coffee, code and Linux in one go. Having the chance to exchange experience and to discuss certain aspects of technology saves you time and money, and it's a pleasure to enjoy. Compared to dusty books and remote online resources. It's human! There are free smartphone apps for Android and iOS from Meetup.com that allow you to keep track of meetings and to stay informed on latest updates. And last but not least, there is a Trello workspace to collect and share ideas and provide downloads of slides, etc. Trello is also available as free smartphone app. The MSCC is now officially participating in the O'Reilly UK User Group programm and we are allowed to request review or recension copies of recent titles. Additionally, we have a discount code for any books or ebooks that you might like to order on shop.oreilly.com. More applications for user group sponsorship programms are pending and I'm looking forward to a couple of announcement very soon. And... we need some kind of 'corporate identity' - Over at the MSCC website there is a call for action (or better said a contest with prizes) to create a unique design for the MSCC. This would include a decent colour palette, a logo, graphical banners for Meetup, Google+, Facebook, LinkedIn, etc. and of course badges for our craftsmen to add to their personal blogs and websites. Please spread the word and contribute. Thanks! Microsoft Virtual Academy published a statement I made during the 'Advanced Windows Store App Development with HTML5 Jump Start' session. Pluralsight invites their subscribers on Android devices to give a try to the recent beta version of their offline player with variable playback speed.